Unless walking around with the sensation of a nail stuck in your heel is your idea of fun, there’s really not much to like about plantar fasciitis. It’s kind of like saying, “It only hurts when I breathe,” except in the case of plantar fasciitis sufferers, it only hurts when you walk or stand. Otherwise, it’s not all that bad. Chances are, you’ve suffered from it, particularly if you’re on your feet for extended periods of time, or you’re middle-aged, or a variety of other factors we’ll touch on in a bit. Technically speaking, it involves the band of tissue that connects your heel bone to your toes. When it becomes weak, swollen and inflamed, you’ll feel its unique pain in your heel or bottom of your foot when you stand or walk. Repeatedly straining the ligament that supports your arch can cause tiny tears in your ligament. You’ll often feel plantar fasciitis pain when you first get out of bed after an extended rest and take your first steps of the day. You may feel less pain and stiffness once you’re up and moving around, but they’ll often return as the day goes on. It’s worth noting that pain in your feet at night, after you’ve been off of your feet for a time, may point to other issues, such as arthritis or tarsal tunnel syndrome. But you may be at higher risk for plantar fasciitis if you have high arches, feet that roll inward while walking, flat feet, or tightness in your Achilles tendon or calf muscles. Being overweight will also put you at a greater risk for PF. Are you a runner who puts in a lot of miles on hard surfaces? You could be at greater risk for plantar fasciitis, as well. There are a variety of ways you can treat the symptoms of plantar fasciitis – ice, stretching, splints, and basically staying off of your feet as much as possible – and these are proven to be effective in many cases. Let’s face it, many of us spend part of our workday on our feet, and many of us are active. Spending the day in bed is, well, not really an option. And that leads us into the not-so-small matter of shoes. If you’re a plantar fasciitis sufferer, your shoes are your foundation, your fine line between further pain and stiffness to moving about comfortably. Simply put, you need to choose your shoes wisely, whether they’re shoes for casual or fitness use. Grabbing the best-looking pair off of the shelf without careful consideration given to factors such as heel support and stability isn’t choosing wisely. That said, here’s a look at what to look for in footwear if you do suffer from plantar fasciitis, as well as some of the top choices out there. What factors determine the best shoes for plantar fasciitis? If you suffer from plantar fasciitis, it only stands to reason that one of the most important factors in selecting your next pair of shoes is what kind of heel support your shoe provides. Examine the shoe’s heel ‘counter,’ the portion of the shoe which wraps around the heel bone. The heel counter controls pronation of the foot; it needs to be firm when you squeeze it. If it’s not firm, it just won’t give you the foot and ankle support you need. Shoes with elevated heels – about an inch high – will relieve pressure on your heels, as well. Flat or neutral heels will force your feet to bear all of your body weight, and thus create more pressure on the plantar fascia. Not good. Next, check the sole’s flexibility. A firm sole is what you’re ideally looking for here, because it will control your foot’s range of motion while helping to maintain foot and ankle alignment. This, in turn, will prevent your plantar fascia from over-extending. Lace-up shoes may be better for you because slip-on shoes are typically meant to fit loosely, and can lack support. Not a hard-and-fast rule here, but something to keep in mind. Your shoes must have strong arch support and midsoles that minimally twist and bend, as well as a support system which allows flexing and bending only at the toe box. You can customize your shoes with orthotics or an arch support (which you can get over-the-counter) which better fits your condition and type of foot structure. Don’t be afraid to consult with an orthopedic foot specialist or a podiatrist before you go shoe shopping. With these factors as your foundation, you can narrow the list of contenders for your next pair of shoes. Oh, and another point. While we’ll be dividing this post into the best shoes for plantar fasciitis in both casual and running styles, it’s important to note that running shoes, in many cases, are simply the best option for plantar fasciitis. You certainly need to take into account whether running shoes are (to you and those in your workplace) considered casual and appropriate for situations other than running. No, we’re not advising that you wear your running shoes to a job interview or cocktail party, but if your job involves standing on your feet all day – and your boss doesn’t mind – then why not wear running shoes? 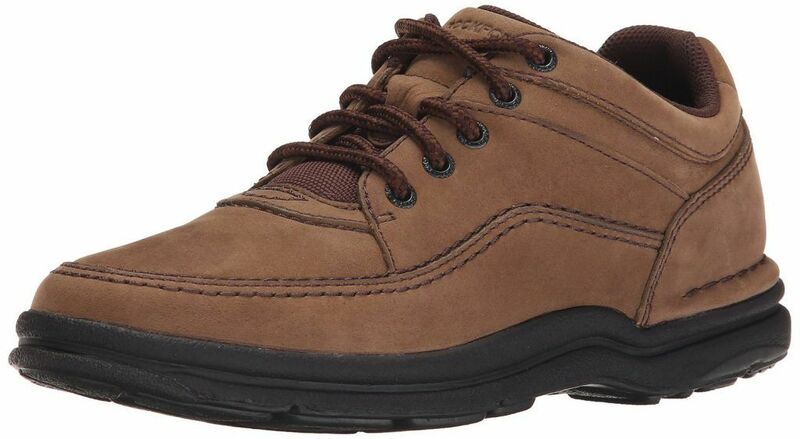 Yes, it’s technically considered a ‘walking’ shoe, but the Rockport Men’s World Tour Classic is an excellent casual shoe if you suffer from plantar fasciitis and spend a lot of time on your feet during the day. Reviewers remark how it’s comfortable right out of the box, and appreciate the high-tech outsoles that support your natural walking motion. Rockport’s walking platform construction provides plenty of support for the heel, in addition to excellent flexibility in the forefoot. Moreover, its padded collar and tongue will keep blisters and lace bruising away. When a shoe is designed specifically with the plantar fasciitis sufferer in mind, you know the folks behind the design don’t take your stabbing heel pain lightly. And, by the way, the Vionic Orthoheel line of shoes is developed by podiatrists, who know more than a little about the science of keeping your feet comfortable and happy. 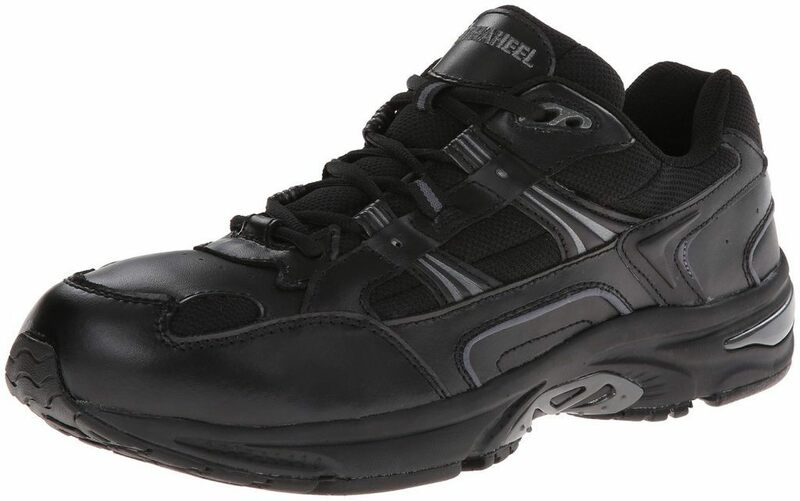 The current Men’s Walker model comes with a deep heel cup and contoured arch, as well as a molded midsole. All told, it eliminates heel pain but also improves your gait, which helps in the fight against plantar fasciitis. Great shoes for standing on your feet all day, and an excellent casual option rather than running shoes. It’s billed as the best shoe for plantar fasciitis on the market, and that wouldn’t be an exaggeration. The New Balance 920 series is known for its exceptional stability and motion control, both key factors in keeping plantar fasciitis at bay. It also features New Balance’s patented Rollbar technology and Abzorb midsole structure for soft cushioning, particularly for overpronators. It’s recommended by plenty of podiatrists and approved by Medicare for diabetic patients. It clearly has a lot going for it. This lightweight slip-on Skechers Go Walk 2 shoe provides more support than you might think and has been a popular choice among women who suffer from plantar fasciitis. They can be worn without socks, and their anti-microbial liners help prevent slipping. Their uppers consist of breathable mesh and come with a convenient heel pull loop. Shoes are obviously a big, big part of what the folks at Skechers do; they develop and market more than 3,000 styles for men, women, and children. Headquartered in Manhattan Beach, Calif., Skechers now sells its shoes – and other apparel – in more than 160 countries. Looks good. Feels good. What’s not to like? The Alegria Paloma Flat “Mary Jane” comes in a variety of eye-grabbing colors and designs, but your feet will also be kept happy by the way it feels. 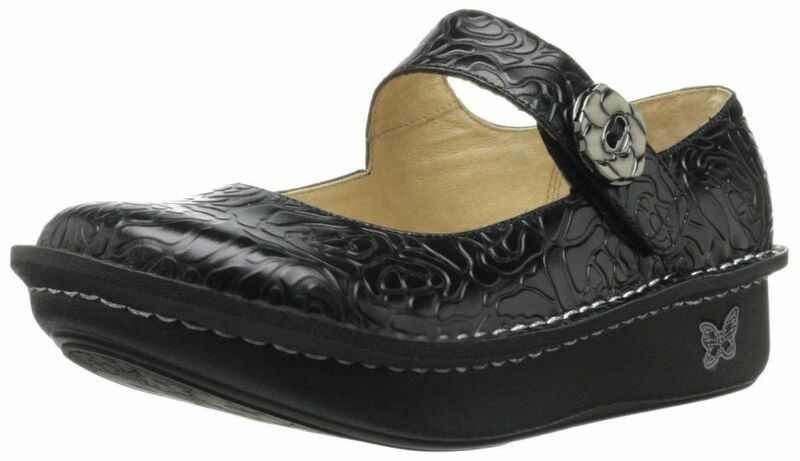 It has an incredibly soft leather interior, but also great heel support and a padded footbed. This provides shock absorption qualities that provide optimal support for plantar fasciitis issues. The insole is also removable to allow for orthotics if you so choose. All in all, a highly comfortable shoe that doesn’t compromise on style. We’d be remiss if didn’t include one sandal on this list, considering that we’re moving toward peak sandal season. Sandals can be oh-so-comfortable yet also provide the kind of support you must have if you’re a plantar fasciitis sufferer. Orthotic sandals, such as the Birkenstock Arizona, consist of sturdy materials that provide plenty of support. Generally speaking, look for sandals that are neither too long nor too short, that have an outer sole that’s thick enough to absorb shocks while providing good traction. And the heel should be high enough to reduce tension on your Achilles. The Birkenstock Unisex Arizona provides all of these things, including a one-inch heel, while its contoured cork footbed offers plenty of arch support. And if you’re from wintry climes, stepping out into the sunshine of a warm day while wearing these sandals sounds pretty darn good right about now. Running while your pain and stiffness are at its highest? Not a good idea. Running while the pain and discomfort have subsided? Sure, but make sure you take the proper precautions (which you should be taking, anyway) such as stretches and ice, while never, ever – ever – skimping on running shoes. You need running shoes that deliver on their promise of comfort and stability. You may be tempted to reach for the most bedazzled, high-tech-looking shoe on the shelf, but comfort and quality should never – ever – be sacrificed for looks. The last thing you want to do is bring on another bout of plantar fasciitis and your training to a temporary halt. While some would advise wearing orthotic inserts in your running shoes if you suffer from plantar fasciitis, a quality pair of shoes with maximum arch and ankle support should do the trick. That said, here are some things to keep in mind as you’re buying your next pair. It should have maximum arch support. Don’t even think about compromising on this. It should have better shock absorption qualities to lessen the impact of your heel striking the pavement. Don’t compromise on this, either. Honestly, it’s best to choose a shoe made by a top brand running manufacturer that you’ve heard of before. Why? Because they’ve invested the money and research into ensuring that their shoe has the arch support and shock absorption that you absolutely must have. Don’t buy a shoe that’s too light or not flexible enough to provide the kind of support you need. Read the reviews. The more positive reviews you can find from runners who suffer plantar fasciitis, the better. Settle in for a nice, easy ride with these gems from ASICS. Reviewers praise the thicker-than-usual foam in the forefoot, even if it does make the shoe a tad heavier and stiff. Heavy and stiff? OK, but we still love it! One reviewer even referred to the ASICS Men’s Gel-Nimbus 15 as the “Cadillac of comfort”, and if your run is going to be like a caddy ride, well, who wouldn’t want to pull these out of the garage for a quick spin around their favorite running route? There’s also plenty of gel cushioning in the mid-sole, as well as a mesh top that helps your feet breathe nice and easy. And don’t forget ASICS Personal Heel Fit technology which provides two layers of foam in the heel area. With cushioning like this, the agony of your feet will dissolve into a cloud of comfort, even if you’re logging some serious miles. 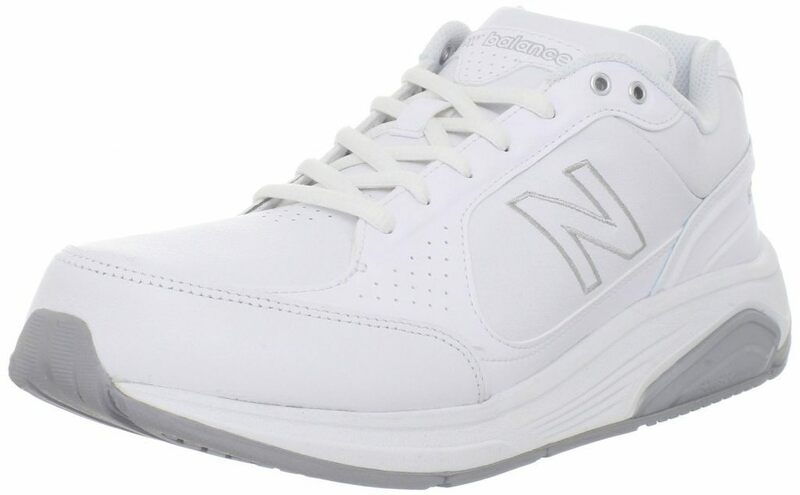 This shoe is a New Balance classic that has yet to outlive its effectiveness. 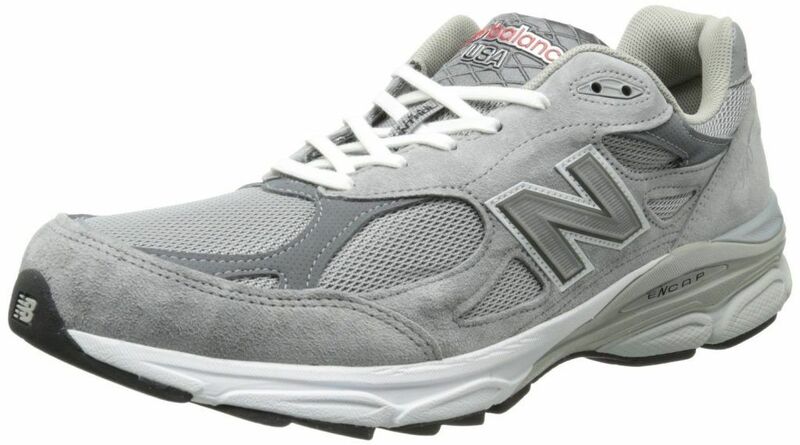 Indeed, some will say the New Balance Men’s 990v3 just gets better with age. Of course, when you make some four million pairs of athletic shoes per year in the U.S., as New Balance does, the process certainly seems to be fine-tuned. People with pre-existing foot conditions – like plantar fasciitis – rave about this shoe’s cushion, support, and comfort. It features a “Dual-Density Collar” that uses both softer density and firmer density foam to achieve its, well, balance of comfort and cushioning. Its blown-rubber forefront provides lightweight cushioning, while it has reflective detailing that’s easy to see during those dusk or evening runs. 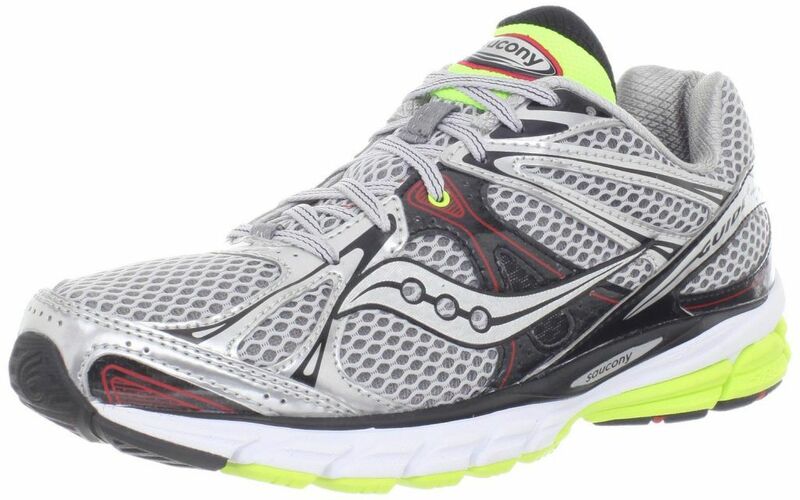 The Saucony Men’s Guide 6 represents a stylish-yet-cushiony upgrade on what already was a top-notch shoe. Lauded as being the leader among the Saucony selections when it comes to providing heel support, the Men’s Guide 6 features Saucony’s PowerGrid midsole, which is designed to absorb impact while distributing pressure evenly throughout the leg. The Saucony technology also includes excellent support and cushion for the heel, which is why plantar fasciitis sufferers like it so much. Note: Saucony has already come out with the Guide 7 and Guide 8, but the Guide 6 is still a go-to shoe for folks with plantar fasciitis. The ASICS Women’s Gel-Noosa Tri9 may be designed for running, but it’s also great for working out in other ways, and comfortable for just about everything you do while on your feet. 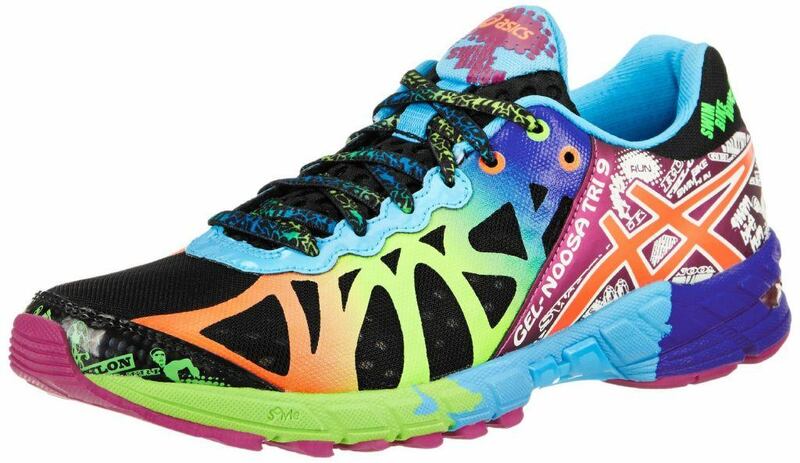 Specifically designed for women, they are bright, colorful and eye-catching, but as we’ve already mentioned, there should be more to your running shoe than what catches the eye. Rest assured, the Gel-Noosa Tri9 delivers more than good looks, with superb cushioning for the heel and the rest of your foot. Its duomax support system will provide all the stability you need, while its mesh upper gives your foot plenty of breathing room. There’s a lot to like about this shoe, including its versatility as it’s great for both road and trail use. 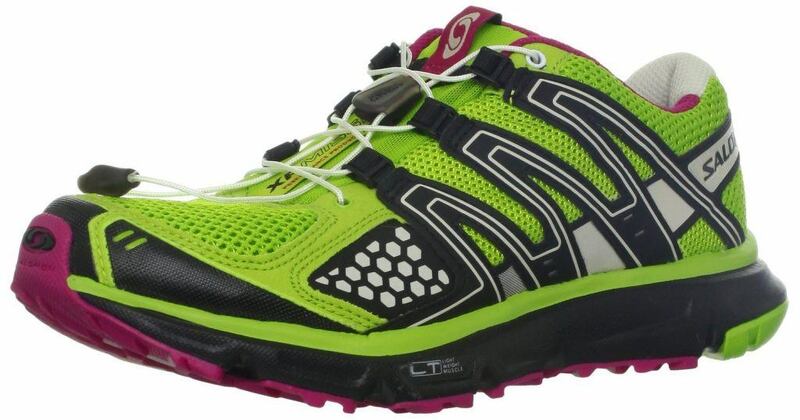 Reviewers particularly like that it’s a lightweight, yet still durable shoe, and that it has a roomy toe area. The all-important heel area of the Salomon Women’s XR Mission is fortified with ortholite foam and provides excellent support without slippage. The shoe’s upper is regarded as one of the best on the market. First of all, the Nike Women’s Dual Fusion 2 is designed with every runner in mind – as all of these shoes should be – because they work well whether you have high or low arches, or no matter your running style. 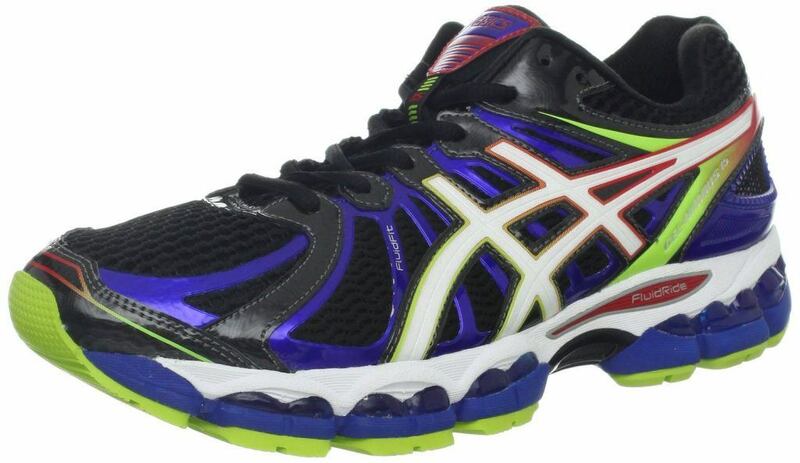 Like the ASICS Gel-Noosa Tri9, it comes in a variety of eye-catching designs and color combinations but still delivers where it counts most, i.e., when you’re logging miles and pounding the pavement. 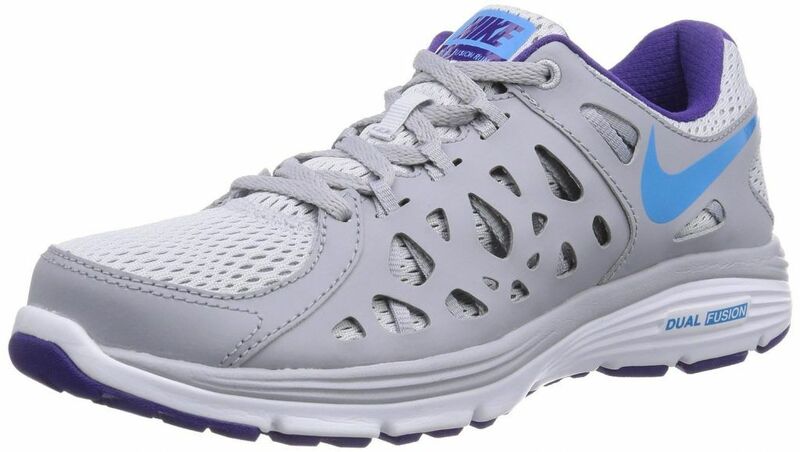 The Nike Women’s Dual Fusion 2 comes with a phylon core that maintains the firmness of the shoe while providing excellent cushioning, durable design with long-lasting support, and a very breathable mesh upper. By now, you get the idea: the shoes you pick can determine how difficult your experience with plantar fasciitis will be. Shoes with more cushioning and support are your best defense against heel pain and plantar fasciitis. But you also need to consider your foot structure, as well as the types of activity for which the shoes are used. Your shoe shopping will take some careful consideration, but making the right choice will keep you from suffering unwanted pain, as well as away from your favorite activities. Looking for sandals (not vionic) for plantar fasciitis. Vionics kill my feet. Stick to wedges. Try Clarke’s cloudsteppers, Ecco and Stofft. I couldn’t tolerate Vionics either. Irritated my already sore foot. But their slippers are terrific in the house. My feet do well with Chaco sandals and no other kind. I have plantar fasciitis and tarsal tunnel syndrome. Check out Spenco Total Support sandals. I have a pair, they feel pretty good. And I couldn’t wear sandals for years.